couple this with active auroral over-the-horizon energy attack technologies, and you get a major tool of political control. couple this with itself and there may be a localized quantum bio-electric active Cortical over-the-horizon energy thought technologies, and you may get a major tool of reality control. "We don't know yet the 'So what?' part of this discovery entirely," says neural and biomedical engineer Dominique Durand from Case Western Reserve University. "But we do know that this seems to be an entirely new form of communication in the brain, so we are very excited about this." For example, researchers have been aware for decades that the brain exhibits slow waves of neural oscillations whose purpose we don't understand, but which appear in the cortex and hippocampus when we sleep, and so are hypothesised to play a part in memory consolidation. "The functional relevance of this input‐ and output‐decoupled slow network rhythm remains a mystery," explains neuroscientist Clayton Dickinson from the University of Alberta, who wasn't involved in the new research but has discussed it in a perspective article. "But [it's] one that will probably be solved by an elucidation of both the cellular and the inter‐cellular mechanisms giving rise to it in the first place." To that end, Durand and his team investigated slow periodic activity in vitro, studying the brain waves in hippocampal slices extracted from decapitated mice. "To ensure that the slice was completely cut, the two pieces of tissue were separated and then rejoined while a clear gap was observed under the surgical microscope," the authors explain in their paper. "The slow hippocampal periodic activity could indeed generate an event on the other side of a complete cut through the whole slice." If you think that sounds freaky, you're not the only one. The review committee at The Journal of Physiology – in which the research has been published – insisted the experiments be completed again before agreeing to print the study. Durand et al. dutifully complied, but sound pretty understanding of the cautiousness, all things considered, given the unprecedented weirdness of the observation they're reporting. "It was a jaw-dropping moment," Durand says, "for us and for every scientist we told about this so far." "But every experiment we've done since to test it has confirmed it so far." It'll take a lot more research to figure out if this bizarre form of neural communication is taking place in human brains – let alone decoding what exact function it performs – but for now, we've got new science that's shocking in all kinds of ways, as Dickson adroitly observes. "While it remains to be seen if the [findings] are relevant to spontaneous slow rhythms that occur in both cortical and hippocampal tissue in situ during sleep and sleep‐like states," Dickson writes, "they should probably (and quite literally) electrify the field." This may just be a WAYYYYYYYYYYYYYYYYYY Out There thought? If there is a wireless way in as per your OP Bill. Logially there is a way out??? Quantum secure direct communication (QSDC) is an important branch of quantum communication, based on the principles of quantum mechanics for the direct transmission of classified information. While recent proof-of-principle experimental studies have made remarkable progress; QSDC systems remain to be implemented in practice. 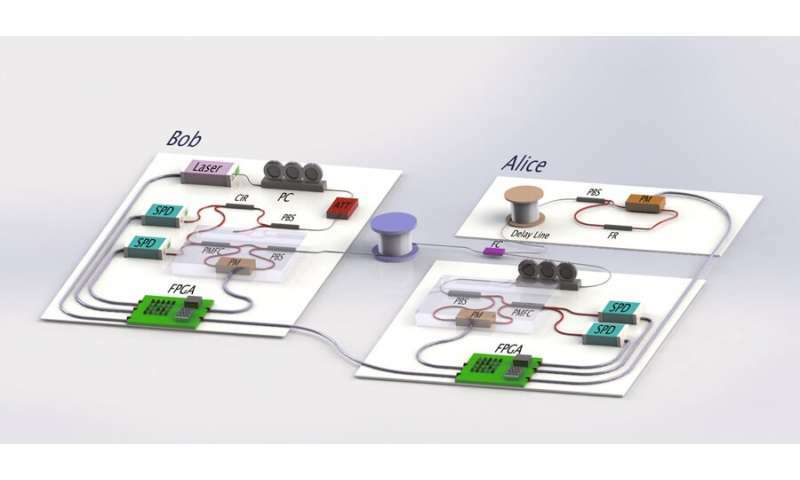 In a recent study, Ruoyang Qi and co-workers at the departments of low-dimensional quantum physics, information technology, electronics and information engineering, proposed and experimentally implemented a practical quantum secure communication system. In the work, Qi et al. analyzed the security of the system using the Wyner wiretap channel theory. 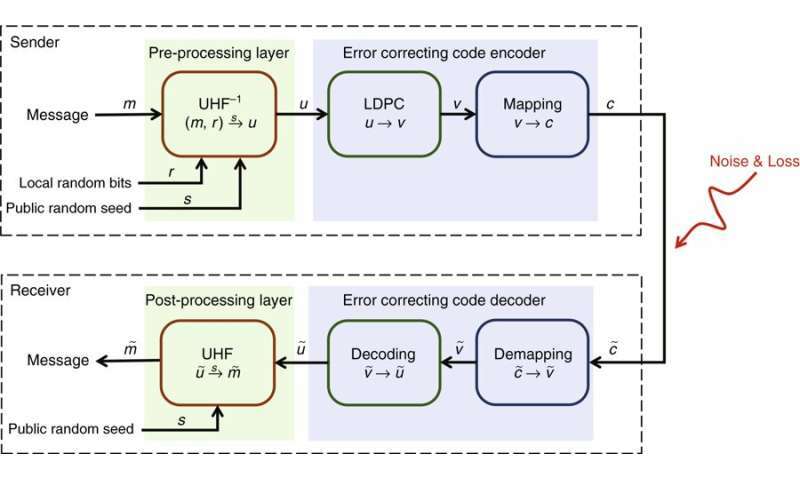 The scientists developed a coding scheme using concatenation (interconnected) low-density parity-check (LDPC) codes in a realistic environment of high noise and high losses. The system operated with a repetition rate of 1 MHz across a distance of 1.5 kilometers and maintained a secure communication rate of 50 bps to send text messages, reasonably sized images and sounds. The results are now published in Light: Science & Applications. The work by Qi et al. highlighted a form of QSDC that can transfer direct information without a distribution key to prevent vulnerability to attacks. In the work, the team used a 1550 nm laser to generate single photons that carried secure quantum information, the scientists were able to successfully decode the information upon receipt. The method was reliable even in realistic environments caused by high photon loss or errors introduced due to noise. 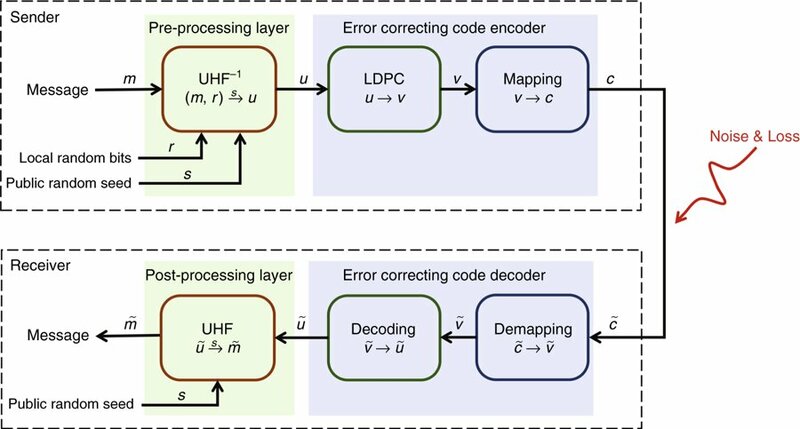 The standard LDPC code that they used in the study for better error-correction performance was implemented by the Consulate Committee for Space Data Systems (CCDS) for near-earth and deep-space applications. Global security depends on secure communication infrastructures. At present, communication is secured via encryption techniques such as the RSA public key scheme. The secrecy capacity is defined as the supremum of all achievable transmission rates with security and reliability. 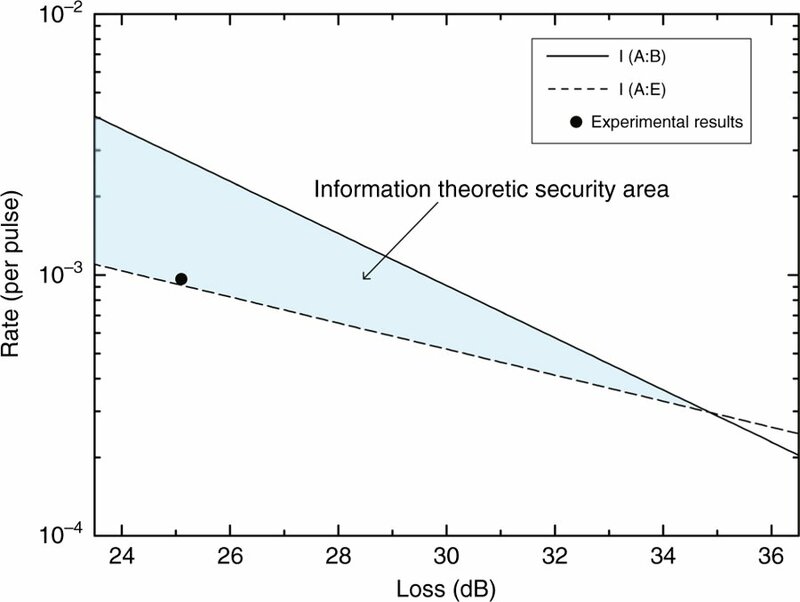 In practice, it is difficult to estimate the secrecy capacity in classical communication systems due to the difficulty with eavesdropping detection. In quantum systems, single photons or entangled photon pairs can transmit digital information, giving rise to new features in quantum cryptography, unattainable in classical transmission media. In principle, it is impossible to eavesdrop without disturbing the transmission so as to avoid detection in such a setup. The first quantum communication protocol was proposed by Bennett and Brassard (BB84), based on exploiting quantum resources for secure key agreement. In 2000, QSDC was proposed to communicate information directly without a secret key and eliminate loopholes associated with key storage and ciphertext attacks. Subsequent proof-of-principle studies have demonstrated QSDC based single photons and entangled pairs, including studies where a fiber could communicate across a meaningful distance of 500 m using two-step QSDC protocols. In the present study, Qi et al. implemented a practical quantum secure direct communication system using a procedure based on the DL04 protocol (without a key). According to the Wyner wiretap model, to implement the QSDC system in practice, the system should work below the secrecy capacity of the channel for secure information transmission. The scientists estimated the secrecy capacity of the system using interconnected low-density parity check (LDPC) codes. They designed the scheme to specifically operate in high loss and high error-rate regimes, unique for quantum communication. Qi et al. thus demonstrated the QSDC platform could effectively function in a realistic environment. Hypothetically, Bob is a legitimate information receiver who prepares a sequence of qubits. Each qubit is randomly in one of the four states (|0>, |1>, |+> and |->). He then sends the sequence of states to the information sender Alice. Upon receiving the single photon sequence, Alice randomly chooses some of them and measures them randomly. She publishes the positions, the measuring basis and measurement results of those single photons. Bob compares this information with his preparations of these states and estimates the bit-error rate of the Bob-to-Alice channel and informs Alice through a broadcast channel. Alice can then estimate the maximum secrecy capacity (Cs) of the Bob-to-Alice channel using the wiretap channel theory. Alice chooses a coding sequence for the remaining qubits. This scheme is based on the interconnected LDPC codes. She constructs the code words and returns them back to Bob. Bob decodes Alice's message from the signals he received after measuring the qubits in the same basis as he prepared. If the error rate is below the correcting capability of the LDPC code, the transmission is successful. They then start again from step 1 to send another part of the secret message until they completely transmit the entire message. If the error rate is greater than the correcting capacity of the LDPC code, neither Bob nor the eavesdropper Eve can obtain information, in which case they terminate the process. Qi et al. used highly attenuated lasers as an approximate single-photon source in the implementation. 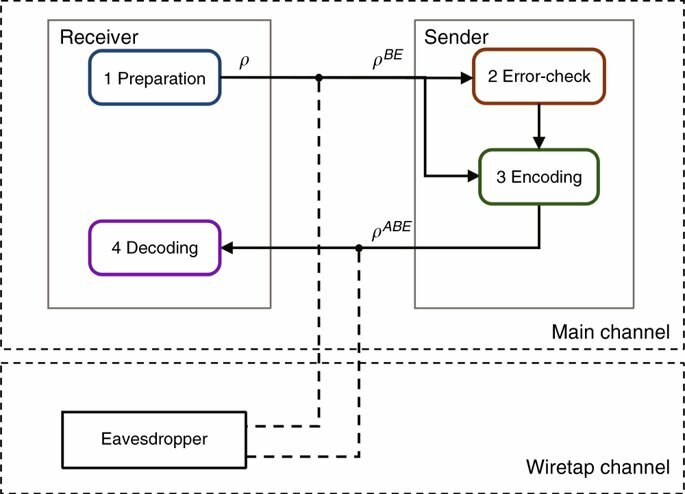 For better approximation of a single photon source to detect eavesdropping attacks, a decoy state quantum key distribution method can be used. If the secrecy capacity is non-zero for any wiretap channel, i.e. 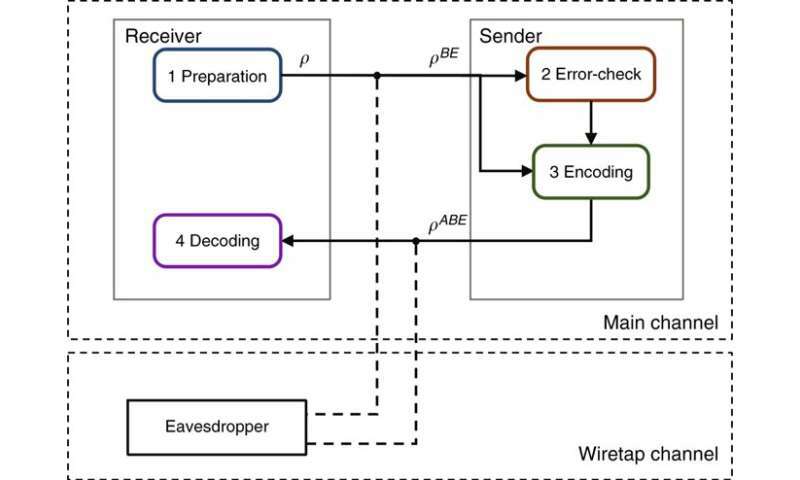 if the legitimate receiver has a better channel than the eavesdropper, there exists some coding scheme that achieves perfect secrecy according to the Wyner model. However, not all coding schemes can guarantee the security, which essentially depends on details of the coding. Left: Experimental setup. Right: System stability with different message blocks. ex and ez are the error rates of measurements using the X-basis and Z-basis, respectively, at Alice’s site. e is the error rate at Bob’s site. The error rate was estimated block by block; each block contains 1312 × 830 pulses. The mean number of photons is 0.1. The inherent loss of a quantum channel is 14.5 dB, which includes the efficiency of the detector, ~70%, and the optical elements, ~13 dB. The total loss of the system is 25.1 dB at a distance of 1.5 km. 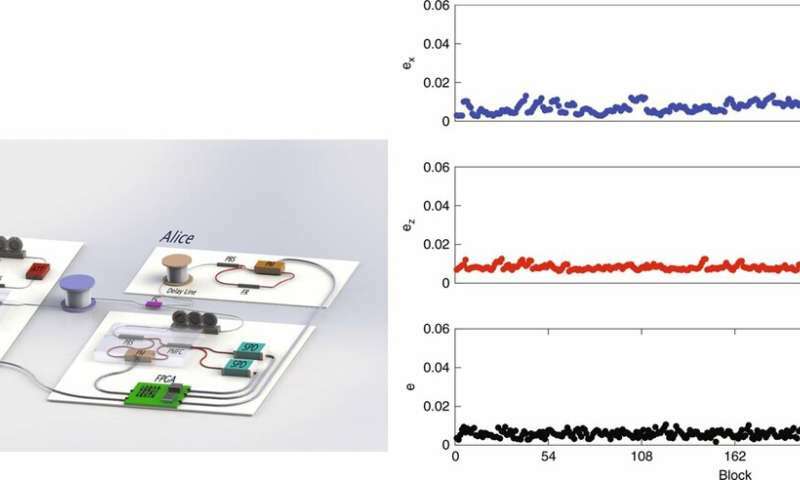 Credit: Light: Science & Applications, doi: https://doi.org/10.1038/s41377-019-0132-3The scientists then implemented the scheme in a fiber system with phase coding, for quantum communication across long distances. 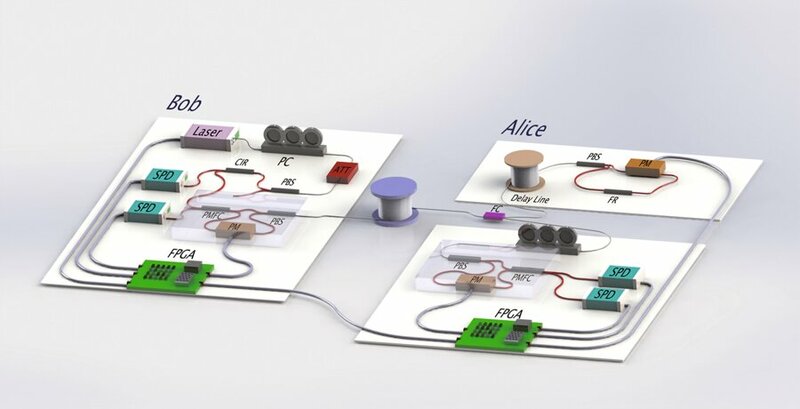 In this setup, Bob prepares a sequence of single-photon pulses, after polarization control and attenuation, the pulses are prepared as random qubits and sent to Alice's site through a 1.5 km-long fiber. On arrival at Alice's site, it's separated in to two parts, where one goes to the encoding module and the other to the control module for error-check, controlled by field programmable gate arrays (FPGAs) in the setup. Simultaneously encoding occurs in the encoding module. If the error-rate is smaller than the threshold, the encoding part is allowed to send the single photons back to Bob via the same fiber, where they are guided to single photon detectors for measurement. The scientists controlled the setup consisting of three phase modulators (PM) and single photon detectors (SPD) to encode messages at the two sites using the FPGAs, which were further controlled by upper-position computers. The solid line represents the mutual information between Alice and Bob; by the noisy-channel coding theorem that transmission rate cannot exceed the capacity of the main channel. The dotted line is the mutual information between Alice and Eve, the maximum information that an eavesdropper can obtain. Symbols represent experimental results. Together with the chosen LDPC code, the coding scheme yields a transmission rate of 0.00096 when the bit-error rate is under 10^−6. Because the rate is greater than the mutual information between Alice and Eve, both the security and reliability of the information transmission are assured. Credit: Light: Science & Applications, doi: https://doi.org/10.1038/s41377-019-0132-3In the experimental results, the scientists represented the mutual information versus the loss of the system as two straight lines. The area between these two lines formed the information theoretic secure area. As a result, for a coding scheme with an information rate within the specified area, the security could be reliably guaranteed. Using the experimental setup, Qi et al. attained a secure information rate of 50 bps, well within the defined secure area. Illustration of the coding scheme. A message m together with a local random bits r and public random seed s are processed by the reverse universal hashing families UHF−1 to vector u, and then u is changed by LDPC code into v, which is mapped to codeword c and is then sent to the receiver's site. Because of loss and error, receiver Bob receives a degraded codeword, and then he demaps, decodes and obtains the message after performing universal hashing families UHF. Credit: Light: Science & Applications, doi: https://doi.org/10.1038/s41377-019-0132-3The scientists illustrated a coding scheme to guarantee the reliability of transmission for QSDC based on interconnected LDPC codes. Preprocessing was based on universal hashing families (UHF). In the process, for each message (m), the sender Alice generates a local sequence of random bit ® and public random seed (s). Next, she maps to a vector (u) by the inverse of an appropriately chosen UHF (UHF-1), which is then changed by LDPC code into (v), mapped to codeword © and sent to the receiver's site. 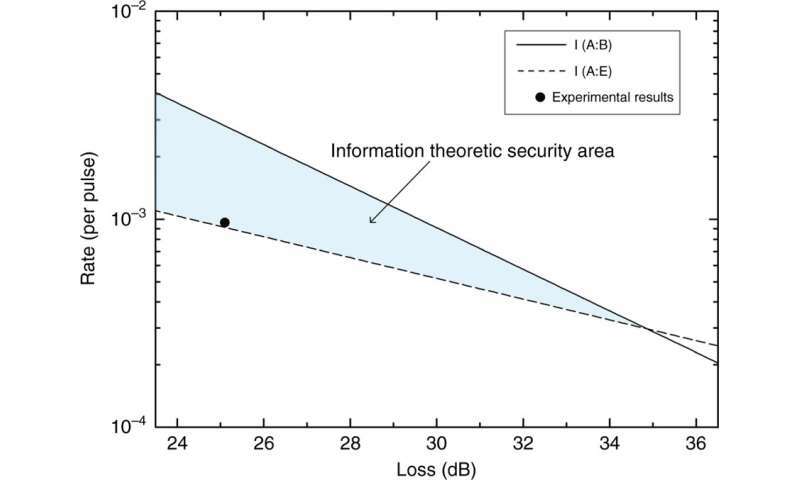 In information theory, the noisy-channel coding theorem establishes reliable communication for any given degree of noise contamination of a communication channel. To ensure reliability of the information, Alice modulates the pulses that reach the legitimate receiver Bob, who makes measurements in the same basis as he prepared them. Due to loss and error, Bob receives a degraded codeword, which he demaps and decodes after postprocessing with UHF to obtain the message. In this way, Qi et al. implemented a practical QSDC system in a realistic environment of high noise and high loss. Among other techniques, the scientists used an LDPC code to reduce error and loss in the system. They analyzed the security of the system in depth using the Wyner wiretap channel theory. When the secrecy capacity was non-zero; a coding scheme with an information rate less than the secrecy capacity ensured both security and reliability of the information transmission. In total, the scientists obtained a secure information rate of 50 bps at a practically meaningful distance of 1.5 km. Qi et al. imply these parameters are premature and envision an improved system that can integrate the existing technology for a higher rate of dozens of kbps information transmission in the future. More information: Implementation and security analysis of practical quantum secure direct communication www.nature.com/articles/s41377-019-0132-3, Ruoyang Qi et al. 06 February 2019, Light: Science & Applications. Secure direct communication with a quantum one-time pad journals.aps.org/pra/abstract/ … 3/PhysRevA.69.052319, Deng Fuo-Guo and Long Gui Li, May 2004, Physical Review A. A method for obtaining digital signatures and public-key cryptosystems dl.acm.org/citation.cfm?id=359342 Rivest R.L. et al. February 1978, Communications of the Association for Computing Machinery. A Mathematical Theory of Communication dl.acm.org/citation.cfm?id=584093, Shannon C.E. October 1948, The Bell System Technical Journal, IEEE Explore. Lovely. DARPA will be preparing for brain trauma patients. Similar is seen at TTSA as well. is a brain trauma expert, and her expertise is there for brain implant - interface technology. I never have even owned a cell phone but once for two weeks, and then I lost it. Probably would lose my brain implant if I had one. Then what is clairvoyance? telepathy? ... reading each other's minds at the exact same moment? Higher forms of Consciousness aren't part of the military equation. 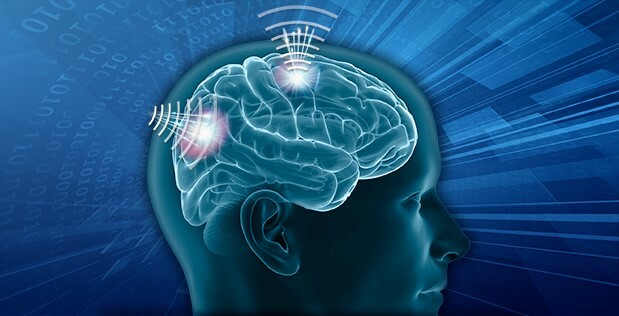 and glamorized DARPA mind control mumbo jumbo served up in warm-n-fuzzy science. 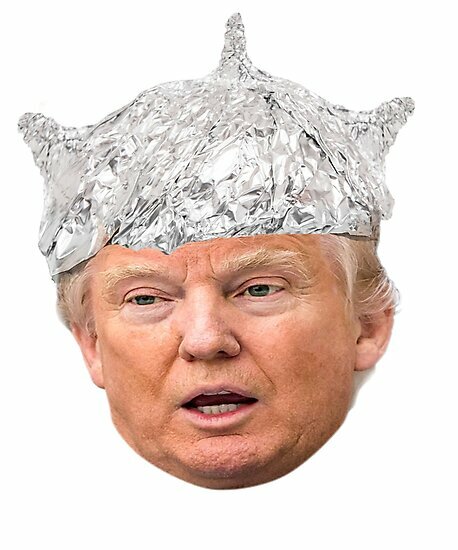 You just need a foil hat to prevent neural interference.